Phuket Island locates in the southern part of Thailand. It is lays in northeast of the Andaman Sea of India Ocean. Phuket Island is known as the "Pearl of the Dammam sea" with its charming scenery and rich natural tourist resource. It has also been reputed to be "Chen-pao Island" and "treasure island". But amount those choices, which one is the suitable and best? It is the more frequent questions that we hear time and again. Well, that is not really a simple question to answer for most beaches have good things and bad things. There are very few beaches that really have everything. Here, based on UME advisors of more than 10-year experience, we we have painstakingly gone through our list of every beach and compiled a list of what we feel are the Top 10 Beaches in Phuket. Best Time: November to April of the following year is the best time for travelling to Phuket Island. 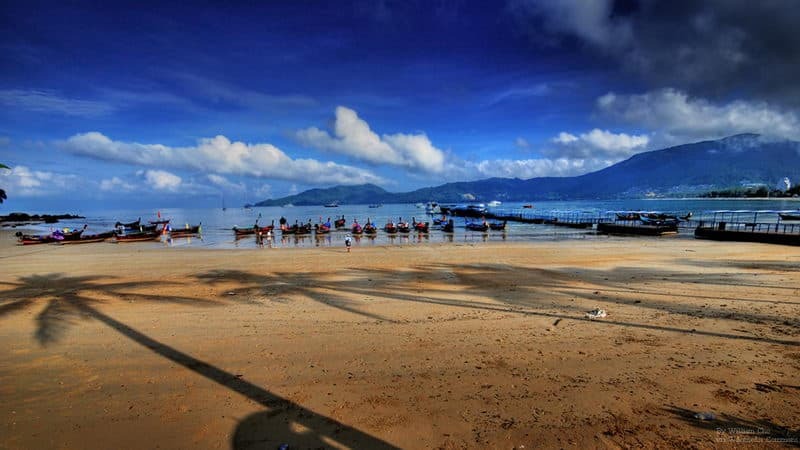 Patong Beach is located in the west coast of the central, 15 km from Phuket Town. Patong is currently the most perfect place in the development of infrastructure. In Patong, in addition to the sun, sand, sea, excited water activities and music, there are also bounce of exotic activities, including famous Simon show and Muay Thai performance. If tourists want to experience the lively nightlife, just walk to Bangla Road along the Patong coastal line. Along Three-kilometer crescent-shaped beach, you can see lots of hotels, supermarkets, shopping malls and various entertainment facilities, all kinds of pleasure. Kata Beach comprises of a half-moon crescent of white sand lining a bay cut deep between two green headlands. Just outside the bay lies a small rounded island. In the high season, the water here is still crystal clear, calm and warm. Kata Beach is well-developed and very convenient, well integrated planning. Buildings here and natural scenery is settled harmonious, not as noisy as that on Patong. Shopping, surfing on the beach are very attractive. Karon Beach is another beautiful beach on the west coast. 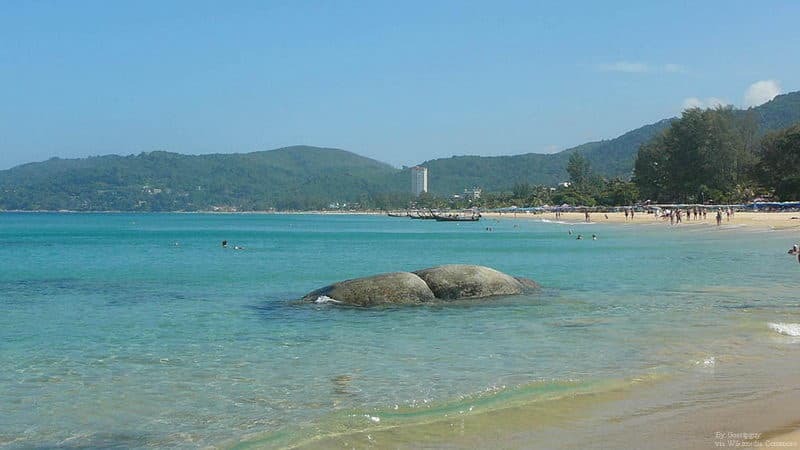 Separated from Patong by a large headland, it's more family-oriented, and one of the longest of the island's beaches, about 7 kilometers. The beach has varied recreational activities: skiing, surfing, parasailing, jet ski. These are very popular, and a try in the rain will be more exciting. The 4-km beach there provides enough space for people playing. Karen beach also has many restaurants, and bars. On the other side of the beach, there is an art community where gathered a lot of Thailand painters and their studio and gallery. 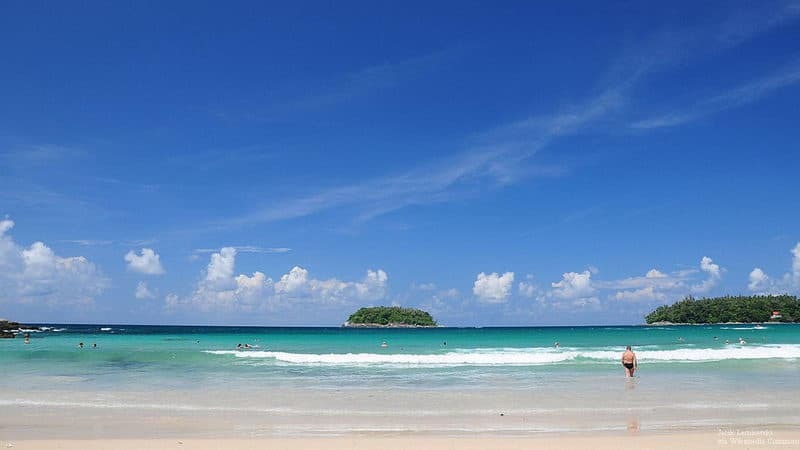 Compared to the Patong Beach, the atmosphere here is more relaxed, not many water activities, but the wave is high enough and very suitable for wave surfing. Kamala beach was originally a quiet Muslim fishing village. 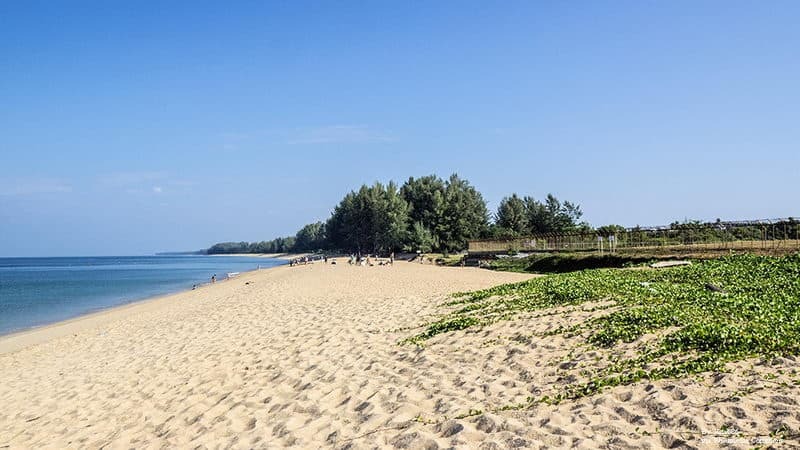 Unlike other beaches, Kamala beach still keeps a relatively undeveloped state, and the island is the only one which maintains the original village views. Unfrequented, quiet and beautiful, this pristine beach is the best choice for relaxing vacation. The water there is shallow and the bottom of the water have many reef so that its water activities is less. Fantasea and the original village attracts many tourists, and the simple environment here is the major reason for many visitors to settle down. Surin Beach is located in the north of Kamala beach, across the symplectic promontory. It is a quiet and charming place. With its beautiful scenery, It is one of the best place to watch the beach sunset in Phuket Island. On a narrow path, filled with a variety of classical style bars, small hotels and shops, you can easily walk along the beach. It features a steeply sloping sand shelf so not a swimming beach. Surin Beach locates near to India. The white wave keep flopping steep cliffs so although the scenery is beautiful, but the steep reef across the sea, water rapids, and deadly undercurrent makes tourists want to swim to stop. But it is loved for its privacy and perfect for sunbathers wanting to flee the crowds. 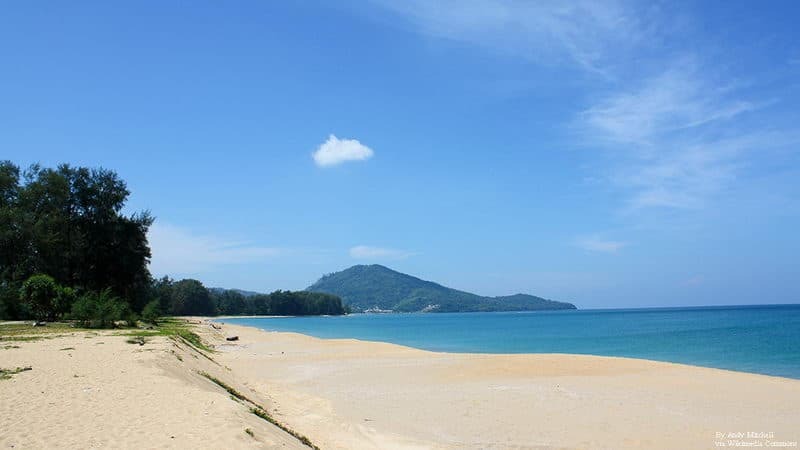 Mai Kao Beach is 40 kilometers away from Phuket Town and is located in northern part of the west coast of Phuket. The beach is about 9 km long and have very few people. The scenery here is quite beautiful and since it is a protected area, it is unsuitable for swimming. This is a fragile eco-system used as an egg-laying ground for sea turtles between November and February. During this period, to see the turtles climbed on the beach side of spawning is the most attractive program in the beach. Many families with children will take kids to participate in this meaningful activity. And April 13th is the most significant day – see newly born sea turtles back to the sea. Phi Phi Island is located in about 20 kilometers southeast of Phuket Island. It is mainly composed of two islands – the Phi Phi Don in the north and the Koh Phi Phi Le in the south. It is a best diving spot. The waters of the Andaman can be reached by boat in around two hours. Famous for their clear waters, surrounding coral reefs, and the crisp, white sandy beaches and for being the location of James Bond and The Beach movies. 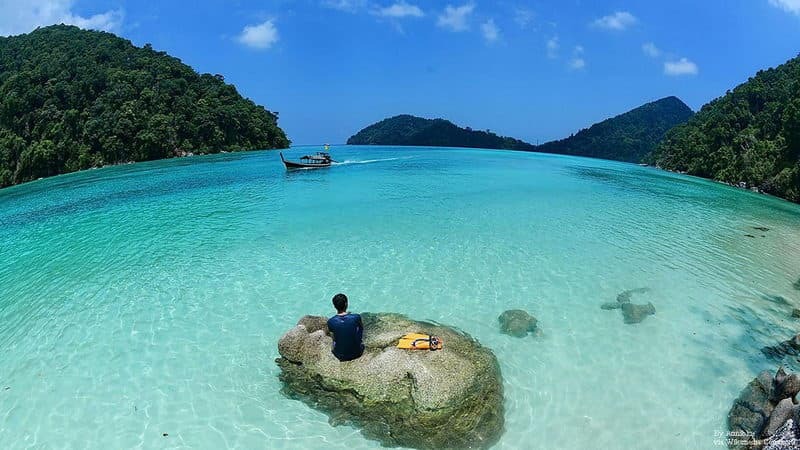 The outstanding view is its tranquil blue sea, extraordinary natural caves as if done by the God and unspoiled natural style, which makes her the most distinguished one among more than 30 Phuket islands. 8. Koh Racha: Bucolic Refuge far away from noisy. 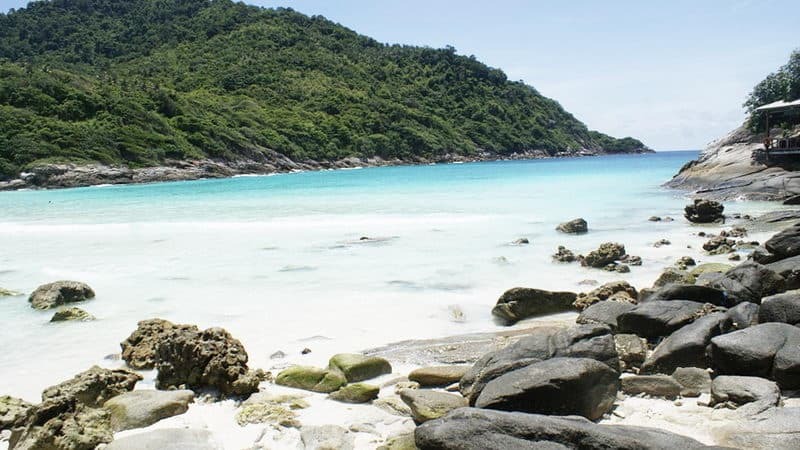 Koh Racha is about 50-minutes distance by berry from the Phuket Island. The island is not only famous for its beautiful and unspoilt tropical scenery, it is also charming for coral reef coast scenery. Because of the late development, the number of visitors here is relatively small. And compared with the noise of the Phuket Island, the beach here is particularly quiet and there are only sporadic swimmers, surfing fancier. Hearing the sound of the wave in the shore and surrounded by beautiful scene, you will feel like you are in Shangri-la. 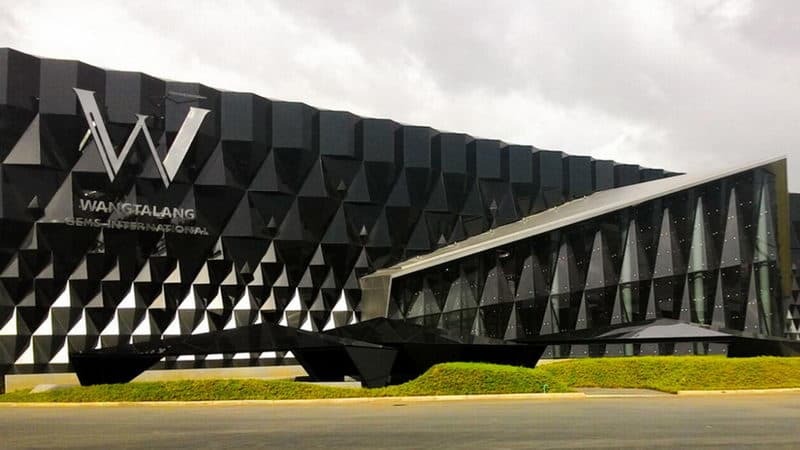 It locates in the west part of Phuket and it is knowed as the biggest jewelry, souvenir and gift shop in Phuket, Wang Talang International Lapidary Co., Ltd specialized in rubies, sapphires, emeralds, pearls, jades and diamonds, and offer genuine Thai silk, elegant ceramics and pewter ware. 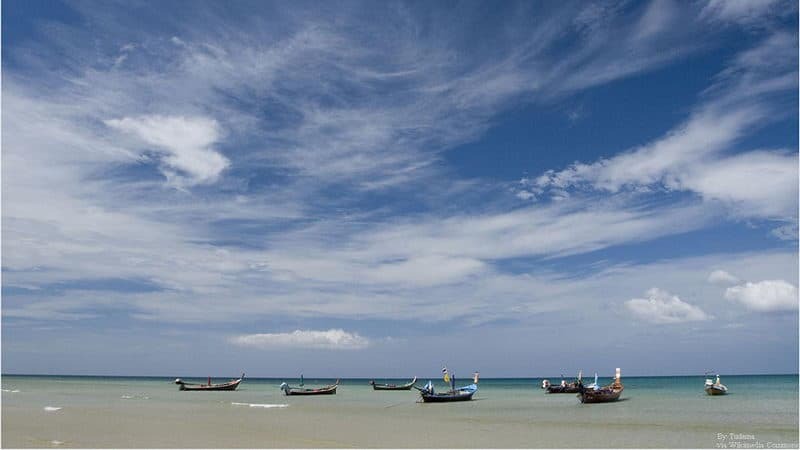 Nai Yang Beach is only a five-minute drive south of the airport and is very popular with Thai locals. It is a quiet and isolated beach set in a national park, ideal for a picnic or swimming and features a beautiful coral reef. Here you will find what a true beach life should be like and it is also a shady spot for souvenir and food vendors.